Here I have 5 mason jars (there are 2 hidden behind the ones in front), and one regular vase (I won this vase at a Close To My Heart Convention a few years ago), corralled on a vintage Coca-Cola tray. The large mason holds some random buttons that I use for card making. The 4 smaller masons are wide-mouth jars, large enough to stuff a small army of ribbon through the top. A few posts ago, I wrote about my new pegboard. The framing of the pegboard is my favorite part, as I painted it a beautiful Lagoon color. Since I had some leftover spray paint from that project, I also painted a few more items around my craft room, including the rims and lids to these mason jars. When I have only a few inches of ribbon left on my spools, I take off the remainder and wrap it around a large popsicle stick (also called a tongue depressor, or jumbo craft stick). 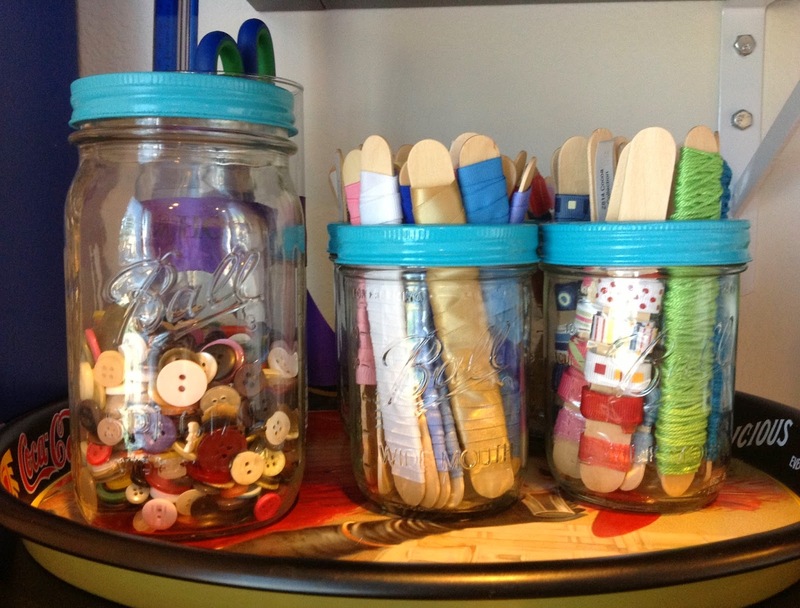 The 4 smaller jars in the picture above hold my ribbon remnants, partially separated by style (grosgrain, twine, waxy flax, organdy, etc.). 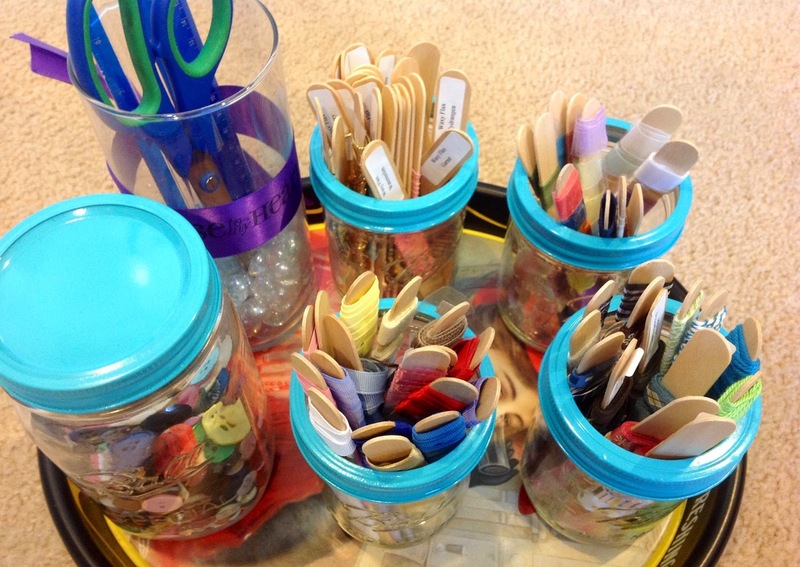 It’s a handy way to store ribbon and save on space in my ribbon organizers! Ahhh, just look at that gorgeous color! 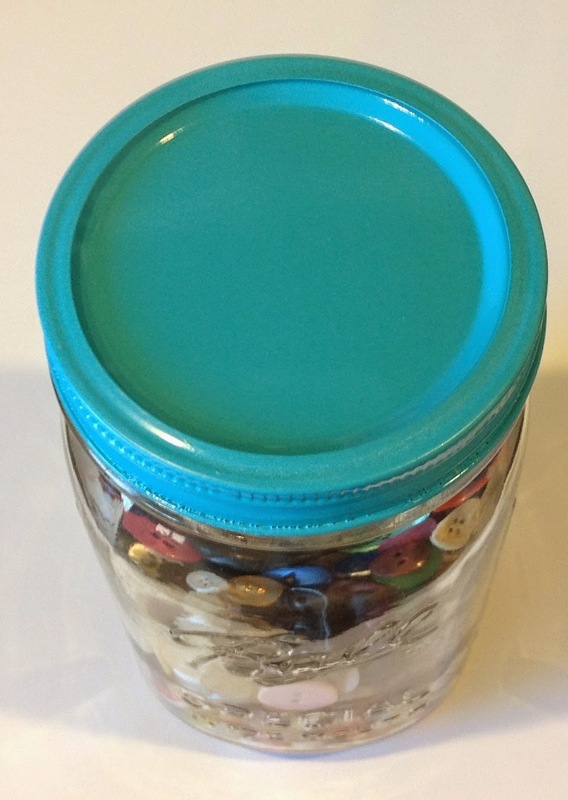 A new coat of paint, even on smaller items, can really change things up in the craft room!